This book got brilliant reviews and was listed in most of the main newspapers’ summer reading lists. It looked like it would be good fun for my five year-old son and so it was! Every morning Mr Peek, puts on his favourite jacket and goes off on his round in the zoo. But this particular morning, the jacket feels a little bit tight and as Mr Peek mutters to myself as he walks around the zoo, a massive misunderstanding between him and the animals starts to develop. 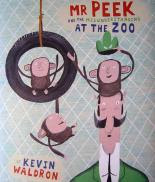 This is a brilliant book; the children loved the story, which they found hilarious, and the artwork is very original, very “retro”. 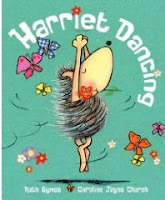 Harriet DancingRuth Louise Symes & Caroline Jayne Church (Chicken House)Absolutely loved by my 3 year-old daughter this is the story of Harriet, the little hedgehog who loves dancing and meets butterflies on her way down to see her little friend. She is desperate to dance with them but the butterflies do not seem too keen on the idea. Although this is by far not the best written book I’ve read this summer (The Truth about Forever, for example, was much better), this remains my favourite. We all know the hysteria around the Twilight series, and without buying into all that madness, I have remained a huge fan. This last installment does not disappoint (although the critics have been pretty tough on Meyer); the story is not left open-ended and I think we get our money-worth. We’ll even forget Meyer for a few pretty bad pieces of writing. Having only discovered Twilight in January, 2008 for me will be the year of Twilight. We all need a bit of light reading sometime and this is it for me!